Flexo plates have a tough job, whirring around on a print cylinder, covered in ink and repeatedly transferring an image to a substrate. But to make sure these plates can withstand the high-impact nature of printing, they require delicate care and maintenance. 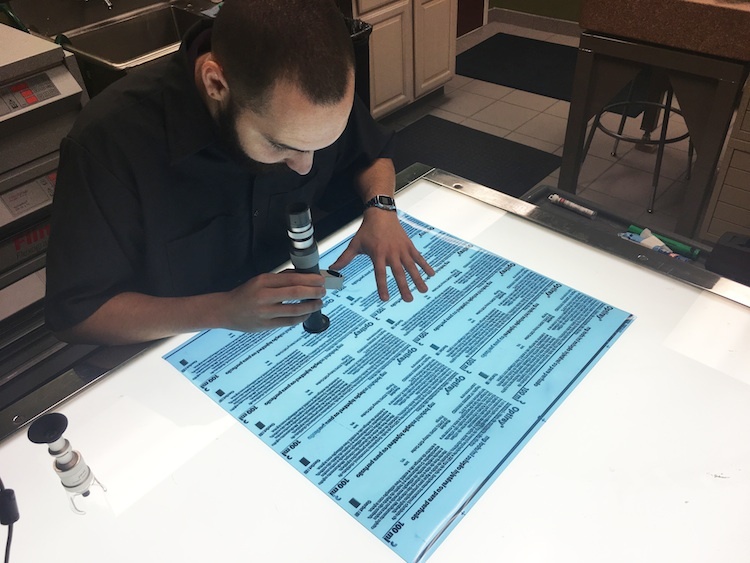 According to Jason Cagle, application development specialist for MacDermid Graphics Solutions, two of the most common missteps in plate cleaning and maintenance are the use of aggressive chemicals instead of those approved for plate cleaning, along with using a coarse rag or brush to clean plates, which can lead to damage. When it comes to chemicals, Cagle explains there are a couple different avenues printers and converters can explore to determine if they’re using a proper solution. First, he recommends printers check with their plate supplier, as they will typically maintain a list of approved chemicals. Additionally, he states that acquiring chemicals via a flexographic products distributor, rather than looking outside the industry, is also a safe option. In terms of the tool being used to remove ink from a plate, Cagle recommends a natural-hair brush, such as horsehair, which allows ink to be removed without much aggressive scrubbing. Likewise, Rich Emmerling, technical director for Flint Group Flexographic Products, suggests printers not use aggressive cleaning procedures when cleaning plates, which can lead to damage. Another potential pitfall for printers is in how they remove plates from the cylinder at the conclusion of a print run, Emmerling says. It’s important to utilize extra caution when removing the plate from the cushion tape, so as to not kink the plate backing, or even worse, tear the plate. A platemaker inspects a nyloflex plate from Flint Group Flexographic Products. Photo via Flint Group. Emmerling explain that plates can also become damaged in storage, and specific steps should be taken to ensure plates are protected even when they’re not in use. If plates are being stored “in the round,” meaning they’re still mounted on a sleeve, Emmerling states that it’s important to keep them wrapped in a film, such as polyethylene, to prevent potential damage from ozone or UV lights, which can alter the physical properties of the plates. Additionally, he explains that if plates are being stacked on top of each other, converters should use a foam or silicone-coated paper interleaf between each plate. Otherwise, he says printers run the risk of plates sticking together or transferring debris from the back of one plate to the printing surface of another. One common storage misstep that Cagle says he often runs into is printers assuming that if a plate has been cured, that it is no longer vulnerable to heat or UV light. He explains that plates should be stored at temperatures below 100 degrees Fahrenheit, which is typically easy to do, but can become challenging for converters storing plates in the rafters of warehouses in warm climates. Similarly, Cagle states that even if a plate is cured, it should be stored away from potentially damaging UV rays. He explains that oftentimes when printers are experiencing plate cracking or durability issues, it’s because their plate storage room has skylights or windows that allow UV light to reach the plates. To avoid these issues, Cagle suggests that printers invest in a film that can be applied to windows to block UV rays. Additionally, he explains that plates can be stored in an envelope or sleeve to block UV light. While care and maintenance for flexo plates is imperative to achieving the highest quality print, ensuring the plate imager is performing at its best should not be overlooked. According to Rory Marsoun, Esko’s VP of business development, flexo, Americas, there are certain steps that should be taken as part of a “weekly checklist,” to keep an imager at peak performance. The first item, he says, is keeping the imager in focus. He explains that it’s rare for a digital plate imager’s laser to shift out of alignment, but it’s important to conduct weekly checks just to be certain that the laser’s focus is in place. Marsoun states that conducting a stain test should also be part of a digital imager user’s weekly checklist. He explains that this test will indicate how well the imager’s laser is removing the black carbon LAMS (laser ablative mask system) layer. Marsoun explains that conducting these focus and stain tests equate to “checking the pulse of the machine,” and if those two aspects of an imager are where they should be, users can be assured that their machine is operating properly. However, if these two tests continually lead to unwanted results, he explains that is when a technician should come in to assess the situation. Additionally, Marsoun explains that Esko and the majority of its customers have a maintenance schedule in place, in which a technician will visit a customer site once or twice per year to perform any needed maintenance, depending on each users’ needs and volume. “Our technician comes in and does all the maintenance necessary to keep the machine running,” Marsoun says.